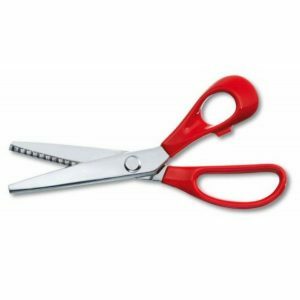 These Victorinox Pinking shears have a utilitarian function for cutting woven cloth. Cloth edges that are unfinished will easily fray, the weave becoming undone and threads pulling out easily. The sawtooth pattern does not prevent the fraying but limits the length of the frayed thread and thus minimizes damage. Total length 21cm.